(Natural News) There is a massive problem threatening mankind’s future: The Earth’s population continues to grow at an unprecedented rate, and our food supply is simply not keeping pace. The total number of people on the planet is expected to reach 8.3 billion by 2030, and by 2050, demand for food will likely have increased by 70 percent. There is clearly a need for innovative ideas to meet this challenge, and a company called Forward Thinking Architecture has risen to the occasion. A desire to use clean, sustainable energy to produce healthy food which can be sold directly to consumers, eliminating the need for both storage and delivery, gave birth to the idea of the Smart Floating Farm. The concept has already become popular on a smaller scale in the form of vertical hydroponic farms, but the Smart Floating Farm takes the idea to a whole new level. 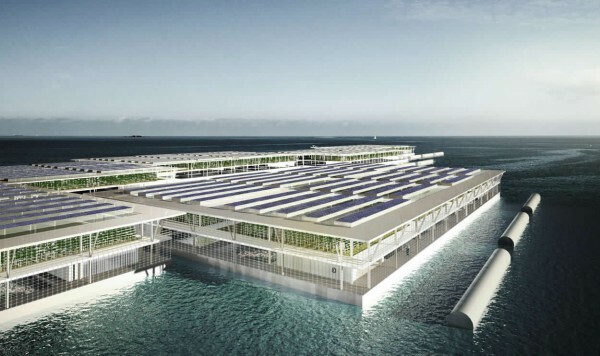 The Smart Floating Farm, for which Forward Thinking Architecture won a Sustainable Entrepreneurship Award (SEA) in 2016, produces upwards of 8,000 tons of vegetables each year. Smaller floating farms can be anchored to land in locations all over the world. Each farm floats on a body of water and consists of three tiers. Right at the top is the photovoltaics level which harnesses clean sources of energy like solar power. The crops are grown in the middle level using hydroponics, and this is also the level which people will be able to visit to learn about the process as well as to buy fresh produce. Finally, the lower level is utilized for aquaculture, which is the production of fish and other species. The Smart Floating Farms come with a slew of benefits, not least of which is the fact that since hydroponics are used, there is no need for the use of chemical pesticides or fertilizers. Another great benefit is the fact that the multi-level strategy results in a higher yield per meter, freeing up land space for other purposes. Water consumption is also greatly reduced, since the water used in the process is what’s floating under the platform already. Smart Floating Farms also allow for the protected year-round growing of a diverse array of plant types. Crops will also not be in peril from droughts, floods or other natural disasters, and can be protected from pests without the use of pesticides. Agricultural runoff will be a thing of the past, and new employment opportunities will become available for locals. The direct nature of the farm-to-table way of selling the produce will eliminate the need for machinery, shipping and storage, while dramatically reducing fuel emissions. Boasting all these advantages, floating farms may well be the future of agriculture, but it may be a while before one reaches an area near you. In the meantime, it is a great idea to become more self-reliant in terms of growing your own fruit and veggies. This will reduce your reliance on others for your family’s food supply, and will mean that you can reap the health benefits of eating non-GMO, organically grown produce year-round.